Anybody want a lap blanket of Fuji, Niou or Tokugawa?!?!?! Exactly like the Tezuka and Atobe versions in Dec 2011 and the Shiraishi and Yukimura versions in Jan 2011 d(^_^o) They are made of fleece with satin lining, really really good quality and they're cuddly!!! 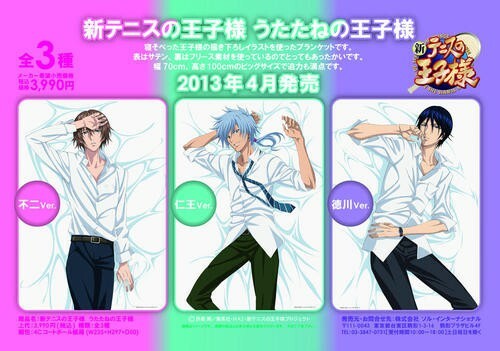 Imagine wrapping these lovely boys around you (^_−)−☆ They are released in April, so around May is when I'll get them. Pricing will be about $70-$75 a blanket. Let me know!! About how much would you be charging for one? About $70-$75 for one =) Are you interested?